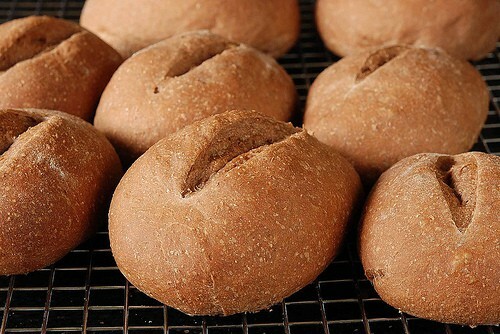 Steakhouse Rolls are darkly colored dinner rolls reminiscent of those served in steakhouses. Instructions included for a bread machine. Dark bread is mysterious to me. Names like pumpernickel and Russian rye don’t help. The stronger flavors aren’t exactly what this midwest farmer’s daughter grew up eating in her lunch box. Bologna and pumpernickel?? But in this recipe, there are no strange flours. No hard-to-find additives or flavoring. 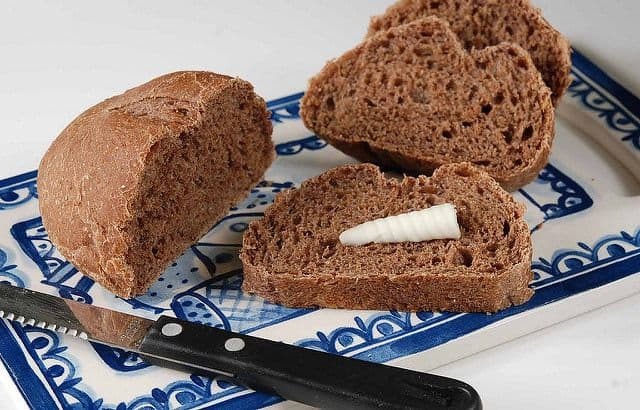 These oversized rolls are reminiscent of the dark loaves served in many steakhouses–the kind brought out on a wooden board with a serrated knife and garnished with whipped butter. You may find yourself looking for a white tablecloth and candles to complete the mood. As with most of my bread recipes, these are baked in a conventional oven. The bread machine does the mixing, kneading, and proofing. All you have to do is form the rolls into a pretty shape. Set for dough cycle. When finished and dough has almost doubled in volume, remove from pan to floured board. 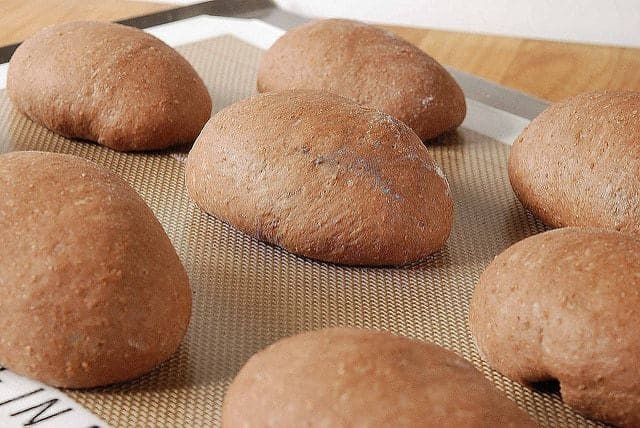 Divide dough into 8 pieces and form into oval rolls. Place on cookie sheet, cover loosely with a tea towel and allow to rise until double in a warm place. Use a serrated knife or kitchen shears to make a slash through the middle. Preheat oven to 350 degrees F. Bake rolls for approximately 20 to 25 minutes. Their dark color makes these rolls somewhat difficult to assess for doneness. Either look at the bottom for browning or check internal temperature which should be close to 190 degrees F. Serve with butter. Do these rolls taste like chocolate? Not at all. They’re similar to the rolls you’d get at Outback Steakhouse. 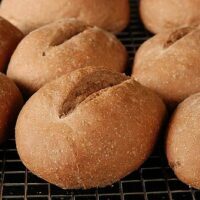 I love your tips for successful bread making! You can used bleached flour. That is all I used for years. 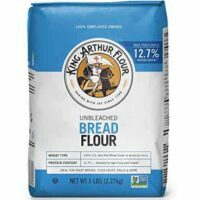 Some recipes may require a tablespoon or more of bleached flour when substituted for the unbleached. This is how I do a lot of my breads. Machine work. Oven bake. Wow. Those look awesome. I’m surprised by the orange juice! Can’t wait to try these! Interesting recipe, I guess we could call them cocoa rolls. I’ve gotten rid of my bread machine. Between my Cuisinart and KA HD stand mixer, I found I really don’t need it. Judy, I love my Cuisinart and KA too. But I can’t set a timer with them. Really handy to throw all ingredients for pizza dough or rolls in bread machine in the morning and walk in the door with dough ready to roll out. Also, the bread machine provides the perfect environment for proofing. Especially handy in the winter. Guess I just find the dough needs less handling than with my other appliances. In fact, I have two bread machines–for use when cooking for a crowd. When you say “instant yeast”, do you mean the dried yeast in the small package that says “instant”. or is does it mean just regular dried yeast in a package? When I say “instant” I’m referring to the little package called instant or bread machine yeast which often comes in jars. Neither instant or bread machine yeast need to be dissolved in warm liquid first as does regular yeast. i’m sure these rolls look beautiful. unfortunately, my work computer is filtering out all pictures on your website. so it’s not as fun to look at. i don’t think there is much you can do to modify this from your end. gotta love corporate computers!